I don't iron, thank goodness for modern fabrics! I hope your foot problems heal soon, I had not heard of the sensor equipment. I am the same as you. I put my clothes in the dryer for only a minute. They come out damp...no ironing! Also we are the same with shoes. I have lymphoma and nothing will fit on my feet except my old black Crocs. Not even 4X extra wide. I have even gone to funerals in them, like the other night. 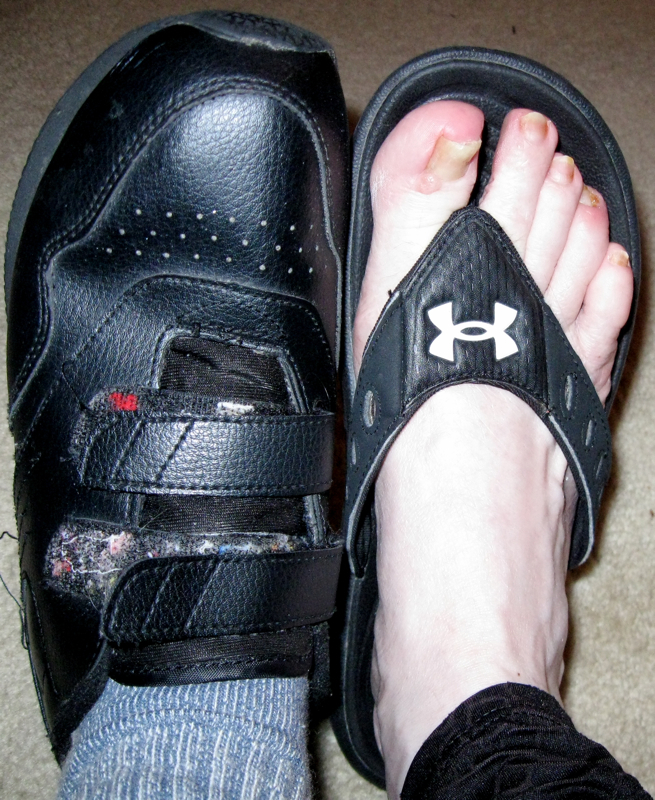 The alternative is having the diabetic shoe people come over and measure me and they would look just like little old lady shoes. And even Crocs are better than that! now i am wondering if my iron will still heat up and steam, when i retired in 06 i gave up clothing that required touch up ironing.. and extreme anything is not my thing except for Extreme Homes on HGTV.. i do love that show, it shows all the crazy ways people build homes, like out of airplanes. i am thinking your boots do not look like Nancy's in the video and also that the clothes you wear with them are not that short. LOL.. I rarely iron, so I can relate to what you wrote. Lol. As for shoes, have you tried SAS open toed sandals? That's what I wear -- even on trips abroad, where a lot of walking is necessary. I have your skinny feet plus chronic planter fasciitis. The shoes that feel the best are basically walking shoes that I wear with everything. They accommodate my orthodics with no problem. I never looked dressed up but am comfortable. Hope you find the perfect shoe for you. Comfort is all that matters. I sympathize with you on the shoe situation. I hope your toe heals soon :) I've become hooked on Crocs. They're about the only shoe I can wear comfortably, so that's what I wear! As for ironing, I avoid it as much as possible, and I've never been very good at it. Ed, on the other hand, can iron a mean dress shirt!